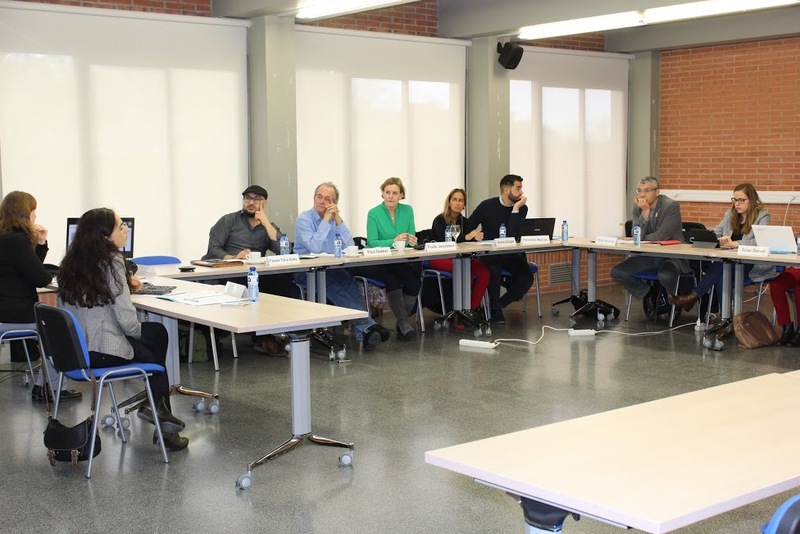 On March 13th the SOLIDUS Policy and Social Dialogue Committee (PSDC) met in Barcelona. Experts, policy makers and civil society representatives from across Europe came together to discuss findings from the SOLIDUS research. The aim of the meeting was to get different opinions and evidence in order to assess how actions based on solidarity that have achieved social impact can become recommendations for social policies. A focus was given to discussions as to how the SOLIDUS findings can have political implications both in the national and the European level. The consultation body was comprised of people with varying backgrounds and nationalities, providing vital insights and experiences. In terms of policy makers, Mrs. Maria de Belém Roseira from Portugal attended, a law graduate who has held numerous positions devoted to political activity, such as Minister of Health and and former Member of the European Parliament. Mr. Oriol Amorós also took part, bringing insights from his position as Catalan Secretary of Equality, Migrations and Citizenship. Further representatives from Spain included Rosa Garvin, the former Spanish Service Manager in the Ministry of Education, Culture and Sports and Lluisa Melgares, former Town Councillor of the Terrassa city government from 2007 to 2017 and responsible of Housing Policies. Experts from various areas also attended. This included Dr. Fran Bennett, from the University of Oxford, UK. As a Senior Research Fellow in the Department of Social Policy and Intervention at the University of Oxford and independent consultant for various NGOs, Dr. Bennett brought valuable knowledge to the discussion. From the Netherlands, Dr. Paul Dekker attended, the Head of Research in the Participation, Culture and Living Environment department in the Netherlands Institute for Social Research. Dr. Fernando Macias, a doctor of Education from Spain also participated, bringing his expertise on Roma inclusion gained in his experience as a project advisor for the Integrated Plan for Roma in the National Government of Catalonia. Finally, various representatives of civil society solidarity initiatives with social and political impact also took part of the discussion in the Committee. This included Mrs. Arora Vargas, a board member of CampusRom, the first Roma University Network of Catalonia. Mrs. Vargas successfully completed the 2017 university entrance exam for people over 25 and is one of the first Roma women from her neighbourhood to attend university. From Cyprus, Mrs. Stephanie Christodoulidou of Europa Donna, an organization that has had significant success in raising awareness of breast cancer, engaging in research and helping sufferers and their families via psychological support, contributed to the PSDC meeting. Mr. Fawaz Taha Zatto, a representative of the Danish group Friendly Villagers, which works on refugee integration by arranging activities and language classes, also attended as well as Mrs. Trude Jacobsen of the Norwegian group A Drop in the Ocean, who bring her knowledge gained working in an organization that provides aid to refugees in Greek camps. From Spain, Núria Marín was present, the head teacher of Colegio Mare de Deu del Montserrat, a learning community school which involves various actors in the community. The meeting provided a space for a vital discussion to take place. With the participants coming from different backgrounds, a thorough understanding of how policy can aid civil society in increasing levels of solidarity was gained. After a brief presentation of each participant, explaining their background and experience, Dr Marta Soler, the principal investigator of the SOLIDUS project presented the main findings of the SOLIDUS research. An overview was given as to what the projects aim is, describing the focus on the existence of solidarity in Europe between citizens. Participants were then able to provide feedback and discuss their experiences and opinions. Later on, the indicators of successful solidarity initiatives were presented. Compiled using the analysis of over 110 SOLIDUS case studies, this toolbox is designed to help civil society organizations demonstrate their impact. Following this, participants discussed the document, providing suggestions for change and addressing how relevant it was for their previous experiences. The meeting involved incredibly interesting discussions. A common theme throughout it was the need for collaboration via egalitarian dialogue spaces. The experiences of participants demonstrated that there is a need for public administration to engage in conversations with civil society. If this is done, policy can be introduced that has a greater chance of succeeding. Overall, there was an agreement that while the existence of civil society organizations that promote solidarity is beneficial, it is important to remember that the state should still be held accountable in terms of its promotion of solidarity. Essentially, a closer collaboration is required and needed.